Pastel de Nata (Portuguese: Pastéis de Nata) or Pastel de Belém is a type of egg tart found throughout Portugal's pastry shops or cafés. Left: The original Pastéis de Belém, in Lisbon. It is believed that it was created before the 18th century by Catholic Monks at the Jerónimos Monastery of Belém, in Lisbon. The Casa Pastéis de Belém in Lisbon was the first place outside the convent selling the original creamy dessert, after the monastery was closed in 1820s, and there they are called Pastéis de Belém, after the name of the area and its famous bakery. Since 1837, locals have gone there to get them warm out of the oven and sprinkled with the cinnamon and powdered sugar. 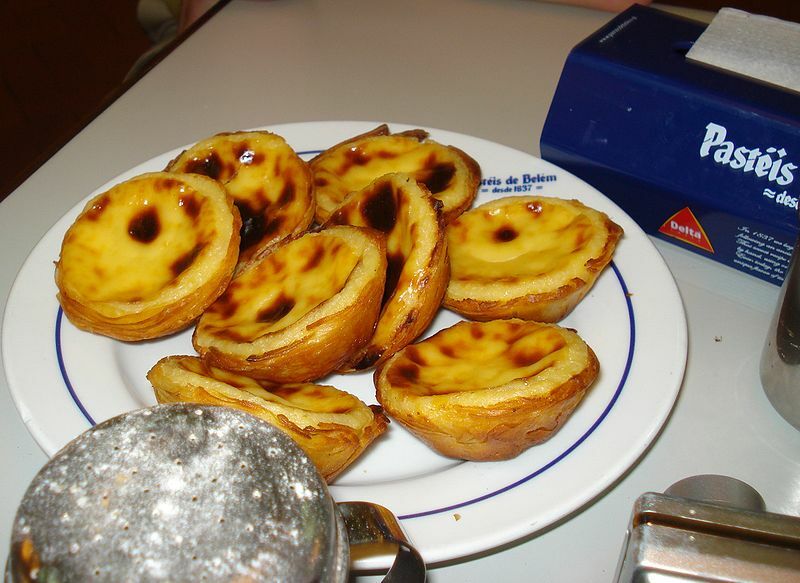 The recipe has, over generations, received some alteration by various pastelarias ("cake shops") and padarias ("bakeries") throughout Portugal. One of these methods includes making the custard in a bain-marie (a bowl over boiling water) rather than combining all the ingredients at once in a saucepan, although some prefer the cream slightly "curdled" to give it a rustic appearance and an unusual texture.